2019 Grammy Nominee for Best Large Jazz Ensemble for the recording “All About That Basie”! In the history of Jazz music, there is only one bandleader that has the distinction of having his orchestra still performing sold out concerts all over the world, with members personally chosen by him, for more than 30 years after his passing. Founded in 1935 by pianist and bandleader William James “Count” Basie, The Count Basie Orchestra has won every respected jazz poll in the world at least once, won 18 Grammy Awards, performed with legendary vocalists like Billie Holiday, appeared in several movies, television shows, and at every major jazz festival and major concert hall in the world. 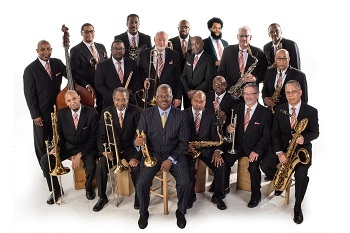 This great, 18-member orchestra, today directed by trumpeter Scotty Barnhart, is committed to continuing the excellent history started by Basie of stomping and shouting the blues, as well as refining those musical particulars that allow for the deepest and most moving of swing.